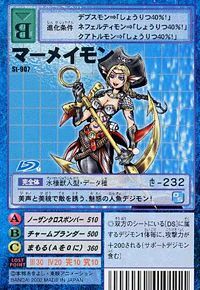 A Digimon with the appearance of the legendary Mermaid, it is based in seas found in cold regions even in the Digital World. It is rare for a Digimon, and as it is good at singing, it does so with a very beautiful timbre, charming those who listen to it. 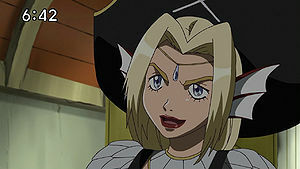 However, because it is greedy and extremely fond of treasure, it charms those with its singing when they feel attracted to it, even if their data (treasure) belongs to other Digimon, and then takes the opportunity to loot from them. For that reason, it is rumored that it hides a vast amount of data somewhere in the Net Ocean, but it loses interest in the data it has looted once it falls into its possession, and discards it. 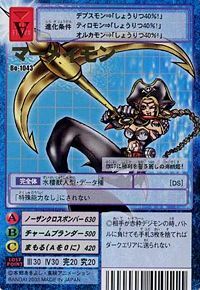 Its Special Moves are drawing near while adorning its beautiful mermaid-like figure, and instantly piercing the enemy with its golden anchor (Charm Plunder), and spinning its golden anchor in a turbulent manner to pulverize the enemy (Northern Cross Bomber). 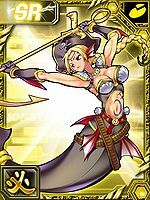 A Digimon with the appearance of a mermaid. As it is good at singing, it charms those who listen to it. Because it is greedy and extremely fond of treasure, it will loot it even if the data belongs to other Digimon. n., From mermaid 「マーメイド Māmeido」, a mythological half human, half aquatic creature. 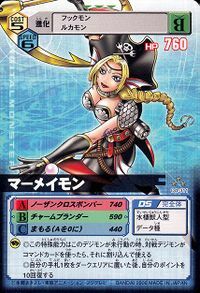 Anime/Manga Digimon Xros Wars: "Cheerful Pirate, Appear! 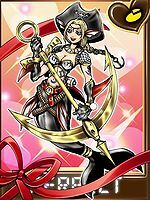 The Voyage to Gold Land!!" Northern Cross Bomber  ノーザンクロスボンバー Nōzan Kurosu Bonbā Spins its golden anchor in a turbulent manner to pulverize the enemy. 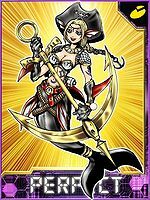 Charm Plunder  チャームプランダー Chāmu Purandā Draws near while adorning its beautiful mermaid-like figure, and instantly pierces the enemy with its golden anchor. 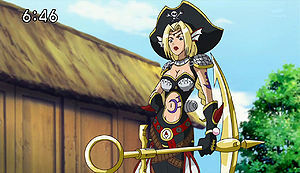 Mermaimon is the leader of Olegmon's army in Gold Land. 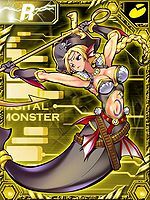 Mermaimon is available as a Digimon Medal. 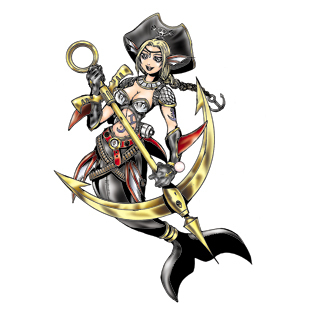 It lures the enemy with its beautiful voice and looks, the captivating mermaid Digimon! 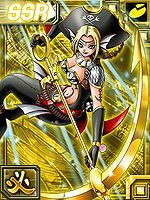 This beautiful pirate princess swears victory on its flag! 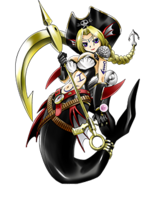 Note: It is not confirmed whether Mermaimon is actually based on the contest entry. 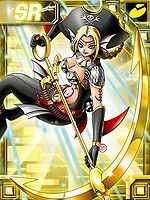 ↑ Mermaimon was adopted from a winning Digimon entry in the Second Original Digimon Contest (Digimon Web). This page was last modified on 16 April 2019, at 03:59.